"Refrigerated pies are perfect when you need a make-ahead dessert. 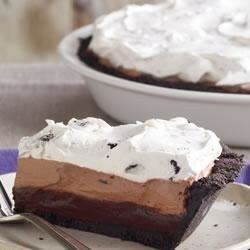 With an OREO Cookie crust and three layers of chocolatey creamy goodness, we suspect that this creamy pie will make it on your list of family favorites." Beat pudding mixes and milk with whisk 2 minutes. Spoon 1-1/2 cups pudding into crust. Stir half the whipped topping into remaining pudding; spread over pudding layer in crust. Chop remaining cookies; stir into remaining whipped topping. Spread over pie. How to Serve: Dip bottom of pie plate in hot water 30 seconds for easy cutting and serving. Tried this one for Thanksgiving and boy was it a hit! My kids loved it. I did cheat and use a cookie crust already made but I had no problems with the layers.. Will be making this one often!! Absolutely loved this recipe!! I was surprised at how simple and tasty this was... Everyone just raved about it!!! Will definitely be making this again and again. Excellent! Huge hit at Christmas. Now it's requested for every holiday! This is my 4th year making this pie for our Thanksgiving feast-family and friends love it and it's a nice to have another option from our apple pie and pumpkin pies -easy to make and really good! This was super easy to make and looks very impressive! This pie was awesome! I will be making this many times in the future!